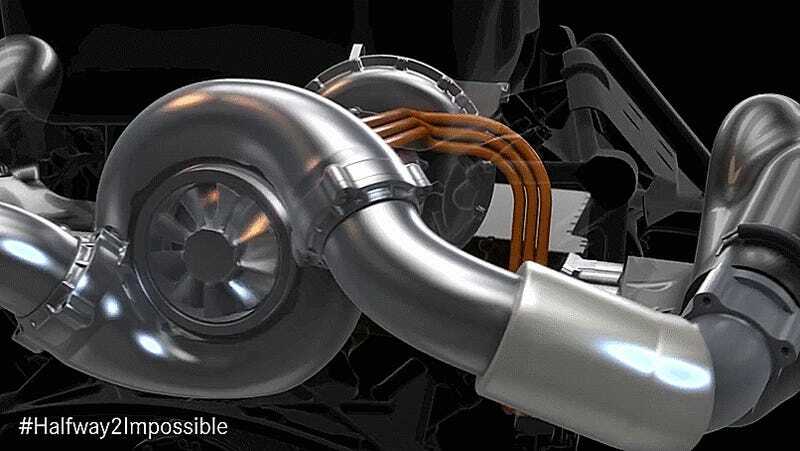 We’ve covered the numerous benefits of the Mercedes Formula One team’s revolutionary split turbo before, but how did the team come up with the idea? Let Mercedes turbocharging team leader Pierre Godof explain why they split the turbo’s components up, and the unlikely sources the team looked to for advice. That’s right—Daimler’s trucks division weighed in on a Formula One car’s design. Splitting the turbo and compressor gave them the solution they needed to keep everything cool and package everything behind the driver more tightly, including the engine, transmission and the generator for the car’s hybrid system. Being able to package everything so compactly has been an enormous performance advantage for Mercedes’ Formula One cars as well, allowing them to run a car with smaller air inlets and narrower bodywork for less drag. Godof hints that similar packaging may be coming to road cars in the future as well. Given their input, hopefully the Daimler trucks division gets first dibs.